Derbyshire Connect is a bus service with a difference! It covers Wirksworth and areas to the west from Ashbourne through the Peak District towns and villages to Hartington in the north on weekdays. You ring to arrange a journey and they come to your house to collect you. Anyone can use it, fares are relatively cheap and railcards accepted. People in towns like Kirk Ireton and Brassington can use it to come to Wirksworth and other towns/villages in the area. Wirksworth people can use it to get out to the Peak District somewhere, go for a walk, and get picked up and returned home at a planned time and place. It takes bikes! The only snag is that you are more likely to get a time you want if you ring at least a week in advance because they make regular journeys getting people to and from schools and work. Find out more on the Derbyshire County Council website here. 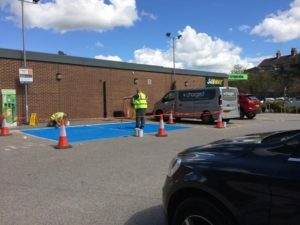 In autumn 2017, the Recycling & Waste group were successful in getting two electric car charging points installed at the Co-op shop, a boon to anyone in Wirksworth who doesn’t have space to park next to the house and have their own charging point.